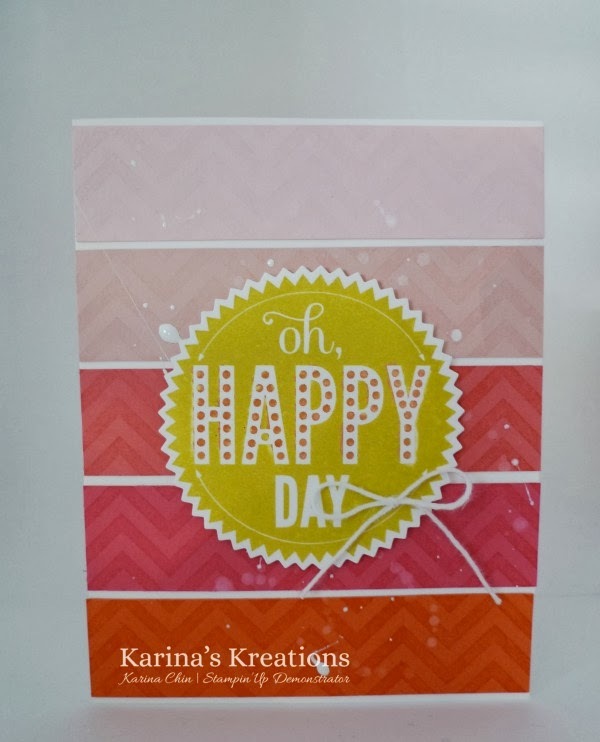 Karina's Kreations: Ombre Leadership Card! I'm helping to organize a creative Day escape for demonstrators and their friends this Saturday at the Sawridge Inn in Edmonton. We're planning on running another one in June! I would love for you come! The starter kit is on sale right now!!! This card is one of my demonstrations copied from Brandi Barnard at the the Stampin'Up leardership event. The style of this card is ombre which means fading from light to dark. What do you think of the color combo? Isn't it gorgeous? The color strips are 1" x 4-1/4". I used Tangerine Tango, Melon Mambo, Strawberry Slush, Blushing Bride & Pink Pirouette. Once the strips were glued down, I stamped the Positively Chevron stamp on the card with Versamark ink. The greeting is from the Starburst Sayings stamp set and it has a matching framelit to cut it out. Buy the stamp set and framelit together and save 15% #134818 (Clear Mount) . It's a great deal!! The greeting was inked up with Summer Starfruit ink. Using an old blender pen, I removed the Summer Starfruit ink from the Polka Dots and added Tangerine Tango ink from a Stampin' Write Marker. The white splotches are from White Craft ink refill and rubbing alcohol flicked on the card with a paint brush. Watch out!!!! This is a very messy technique. This is why I go to Stampin'Up events. I always come home with great ideas that I can copy and share with friends.